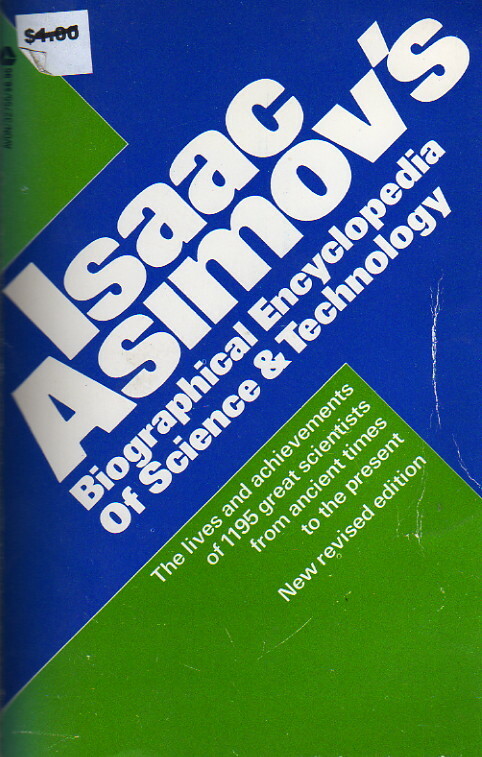 Asimov’s Biographical Encyclopedia of Science and Technology, 2d Ed. In this remarkably thorough and wholly absorbing book, Isaac Asimov traces the history of science from ancient Egypt to modern spaceflight, through the lives and careers of the men and women who made it. In 1,195 biographical sketches, he supplies a wealth of facts and anecdotes that illuminate each scientist’s contribution to the world of knowledge. And by arranging the entries chronologically, he shows the interactions among the various individuals, and among the various branches of science. From Imhotep (Egyptian scholar, 30th century B.C.) to Carl Sagan (American astronomer, born 1934); from Ampere to Fermi to Lamarck to Roentgen to Zworykin; Asimov captures the vast scope and human drama of scientific discovery in a book that makes an invaluable reference—and fascinating reading. This book is a vast improvement on the first edition, but I still wouldn’t recommend anybody actually reading it. Asimov here jettisons the artificial and unfortunate division into main and “footnote” biographies, which makes the book better organized, and updates it with new material and new biographies. While still a useful reference book—it’s the third and final version of this work that is the one people should be using.